It wasn’t long ago – just last year, in fact – that a German car executive described Tesla Motors as “a joke that can't be taken seriously compared to the great car companies of Germany” (Kirschbaum 2016). These days, Telsa has a higher market cap than Ford Motor company, and we see rapid progress in many sectors towards better environmental technology. Exactly when the clean revolution will reach a critical mass will be of utmost importance to policymakers and investors alike, with many standing to benefit from this shift in the way we produce and innovate. Sadly, with Donald Trump pulling the US out of Paris Climate Agreement, questions are surfacing as to the implications of delay. To consider such questions, a deeper understanding of the mechanisms underlying the transition from dirty to clean technology is necessary. Recent economic research recognises the importance of the transition to clean technology in reducing fossil fuel emissions and potentially limiting climate change, while empirical evidence suggests that innovation may switch away from dirty to clean technologies in response to changes in prices and policies. Popp (2002) finds that higher energy prices are associated with a significant increase in energy-saving innovations, while and Aghion et al. (2016) find a sizable impact of carbon taxes on the direction of innovation in the automobile industry and further provide evidence that clean innovation has a self-perpetuating nature, feeding on its past successes. Based on this type of evidence, Acemoglu et al. (2012) suggest that a combination of (temporary) research subsidies and carbon taxes can successfully redirect technological change towards cleaner technologies. Questions remain, however, concerning the combined role of carbon taxes and research subsides in securing a transition to clean energy, as well as the optimal speed of this transition. In recent work, we develop a microeconomic model in which clean and dirty technologies compete in production and innovation (Acemoglu et al. 2016). If dirty technologies are more advanced to begin with, the potential transition to clean technology can be difficult both because clean research must climb several steps to catch up with dirty technology and because this gap discourages research efforts directed towards clean technologies. We estimate our key model parameters from firm-level microdata in the US energy sector, using regression analysis and SMM. Our model performs fairly well in matching a range of patterns in the data that were not directly targeted in the estimation, giving us confidence that it is useful for the analysis of the transition to clean technology in the US energy sector. In our model, which we view as an abstract representation of the energy production and delivery sectors, intermediate goods can be produced either using a dirty or clean technology, each of which has a knowledge stock represented by a separate quality ladder. Given production taxes – which differ by type of technology and thus can act like a ‘carbon tax’ – final good producers choose which technology to utilise. Profit-maximising firms also decide whether to conduct research to improve clean or dirty technologies. Clean research, for example, leads to an improvement over the leading-edge clean technology in one of the product lines, with a small probability of a breakthrough which will build on and surpass the dirty technology when the latter is the frontier in the relevant product line. Research and innovation decisions are impacted both by policies and the current state of technology. For example, when clean technology is far behind, most research directed towards that sector will generate incremental innovations that cannot be profitably produced, except in high carbon tax scenarios. However, if clean research can be successfully maintained for an extended period, it gradually becomes self-sustaining, as the range of clean technologies that can compete with dirty ones expands as a result of a series of incremental innovations. We estimate parameters of this model using microdata on R&D expenditures, patents, sales, employment, and firm entry and exit from a sample of US firms in the energy sector. The data used for this exercise come from the Census Bureau’s Longitudinal Business Database and Economic Censuses, the National Science Foundation’s Survey of Industrial Research and Development, and the NBER Patent Database. We design our sample around innovative firms in the energy sector that were in operation during the period 1975-2004, using our sample to estimate two of the key parameters of the model with regression analysis using R&D and patents. We then combine this structure with a flexible model of the carbon cycle (also used in Golosov et al. 2014) for the analysis of optimal policy and for a range of counterfactual policy experiments. It is intuitive to expect that carbon taxes should do most of the work in the optimal allocation, as they simultaneously reduce current emissions and encourage R&D directed towards clean technologies. However, we find a major role for both carbon taxes and research subsidies. The research subsidy is initially more aggressive and then declines over time, while we find that optimal carbon taxes are back-loaded (but also start declining after about 130 years). Research subsidies are powerful in redirecting technological change, and given this, it is not worth distorting initial production too much by introducing very high carbon taxes. It is important to emphasise that research subsidies are not used simply to correct a market failure in our research. Under our model structure, in the absence of externalities from carbon, or in the special case in which there is only a dirty or a clean sector, a social planner would not have a reason to use research subsidies. This is because a scarce factor (i.e. skilled labour) is being used only for research, and thus the social planner cannot increase the growth rate by subsidising research. Figure 1 shows that optimal policy relies on a very high level of subsidies towards clean research, especially during the first few decades. The social planner would like to divert R&D from carbon-intensive dirty technologies towards clean technologies. She can do so by choosing a sufficiently high carbon tax rate today and in the future, as this would reduce the profitability of production using dirty technologies and secure both a switch to clean production and subsequently to research directed at clean technologies. However, this is socially costly because given the current state of technology, switching most production to clean technology has a high consumption cost (because the marginal costs of production of clean technologies are initially significantly higher than those of dirty technologies). Hence, the social planner prefers to use the carbon tax (tau) to only deal with the carbon emission externality and to rely on the research subsidy(s) to redirect R&D towards clean technologies. 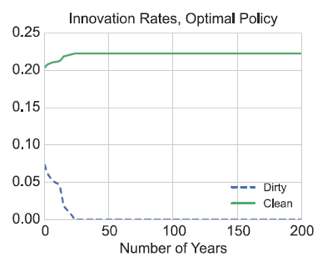 Figure 2 shows that the research subsidy is indeed sufficient to rapidly switch innovation from the dirty to clean technology. We analyse several counterfactuals, one of which is unfortunately becoming more relevant –delaying intervention for 50 years before choosing the optimal policy thereafter. 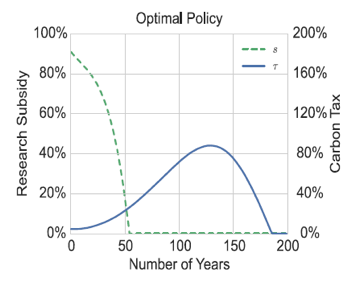 Somewhat paradoxically, delaying the start of optimal policies by 50 years can lead to less aggressive policies from that point onwards. This is because the intervening interval has generated a larger technology gap between the clean and dirty sectors, making a rapid switch from dirty to clean technologies even more painful. Under the baseline carbon cycle framework, this delays the full transition by almost 250 years and results in important welfare loss. If one assumes a more aggressive carbon cycle impact on temperatures, the implications are far worse. Our hope from the model’s framework is that our world finds ways to support clean energy research, which is the most critical input at present, especially considering the lack of support coming from the Trump administration. Acemoglu, D, U Akcigit, D Hanley and W Kerr (2016), “Transition to clean technology”, Journal of Political Economy 124: 52-104. Acemoglu, D, P Aghion, L Bursztyn and D Hemous (2012), “The environment and directed technical change”, American Economic Review 102: 131-166. Aghion, P, A Dechezlepretre, D Hemous, R Martin and J Van Reenen (2016), “Carbon taxes, path dependency and directed technical change: Evidence from the auto industry”, Journal of Political Economy 124. Golosov, M, J Hassler, P Krusell and A Tsyvinski (2014), “Optimal taxes on fossil fuel in general equilibrium”, Econometrica 82: 41-88. Kirschbaum, E (2016), "German automakers who once laughed off Elon Musk are now starting to worry", Los Angeles Times, Web 3 August. Popp, D (2002), “Induced innovation and energy prices”, American Economic Review 92: 160-180.